MFRM ’18 Students Tackle Real Problems in Financial Risk Management - SchoolFinder.com! 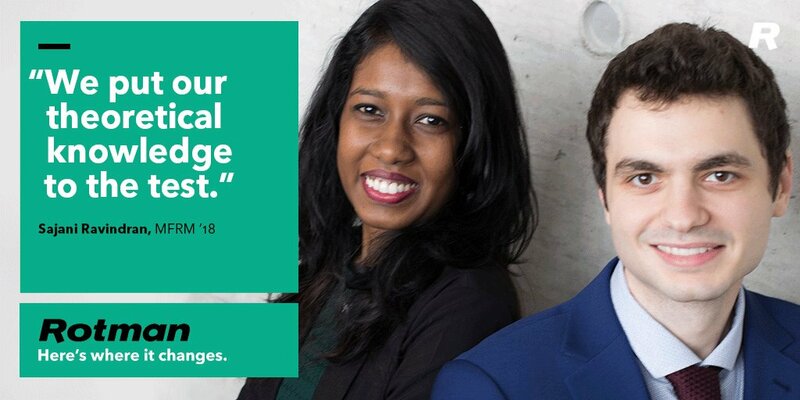 After just 10 weeks into their master’s programs at Rotman, Sajani Ravindran (MFRM ’18) and Chrysafis Tsoukalas (MFRM ’18) found themselves dealing with a real financial risk management issue at CIBC. The bank had introduced a new regulatory compliance management (RCM) library —which is essential for making sure that CIBC is compliant with current regulatory controls and policies — but had concerns about the data. For eight weeks, Ravindran and Tsoukalas put their Excel and VBA coding skills to good use in testing and validating data contained in the library. By the end of the project, they had developed a risk-scoring methodology that was essential for the platform’s function. “It was a very rewarding experience, working on a real problem that a bank was facing,” says Tsoukalas. This is just one example of the many types of projects that students take on during the Master of Financial Risk Management (MFRM) program. During these placements, students apply the concepts they learned in the classroom to take on real risk management challenges at various organizations, including the Bank of Canada, BMO, CIBC, Citi, the CPP Investment Board, EY, FIS, Great-West Life Manulife, McKinsey & Company, National Bank, Ontario Teachers’ Pension Plan, OPTrust, Overbond, TD, RBC, PwC and Scotiabank. And through this experience, students learn a lot about themselves too. In Ravindran’s case, her project experience taught her a lot about communicating clearly. “From learning how to write a concise, to-the-point email to improving how I construct responses to questions on the spot, I saw an improvement in my communication style,” says Ravindran. Meanwhile, Tsoukalas noticed a change in his interpersonal interactions. Because he and Ravindran spent much of their placement meeting with members of the bank’s risk management team, senior executives and a third-party consultancy firm that CIBC was working with, Tsoukalas got a lot of experience working with various types of stakeholders. In addition to refining their communications skills, most students, such as Steve Song (MFRM ’18) and Janice Wang (MFRM ’18), acquired new technical skills and deeper knowledge about risk, thanks to their projects. Impressively, Song and Wang taught themselves the coding language R Shiny, in order to build a new web application that would support RBC Capital Markets in identifying the most appropriate market shock methodology, based on market conditions. By the end of the project, they had developed a functional web dashboard for the team. The MFRM students took a lot away from the experience, too. While many MFRM students worked with corporate industry partners, Candy Mu (MFRM ’18) and Sally Xing (MFRM ’18) completed their placements at Overbond, a Fintech startup and primary bond issuance platform. For their project, the MFRM students worked on developing a successful prototype that would help the growing company generate automated reports, crucial to enhancing Overbond’s work as a bond dealer. For these students, the learning experience was vast and varied. Working in a start-up environment meant that they were constantly learning about new technologies and thinking about how to use them in their current work.